While students need to feed their brains with lessons in school, they must not also forget to feed their hungry stomachs with good food in order to stay physically healthy. 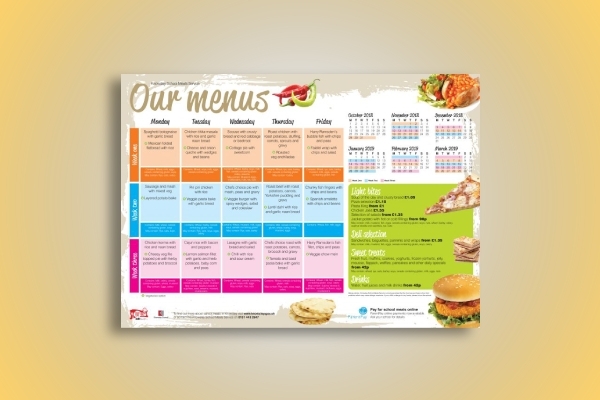 For businesses that are offering food in schools, such as food stalls, canteen, cafeteria, they must provide A menu template for the dishes that they are offering so that the students can choose their preferred meal. Typically, a school menu is relayed to the students beforehand so they can order in advance and for the seller to prepare the food ahead of time. Hence, if you are providing such services, there is a need for you to create a school menu where you can feature the different food that you are offering. 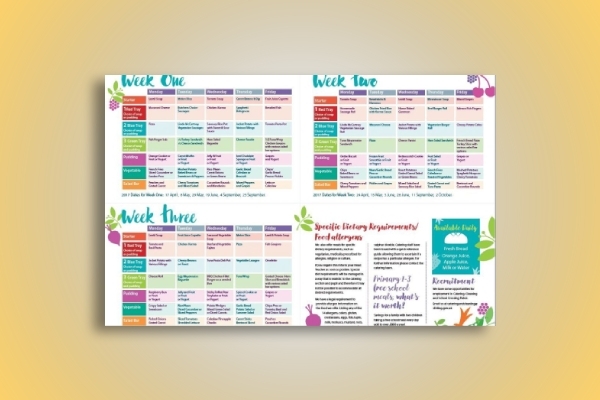 Incorporate additional design elements for it to be more visually pleasing and presentable for the students, and use these templates and examples to achieve the best design for your menu. 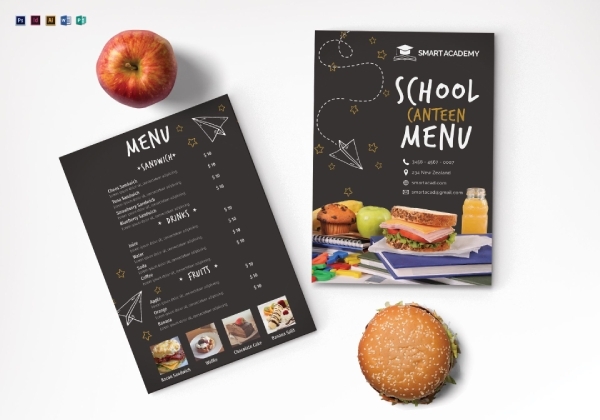 Get those students coming with this striking school canteen menu template that is crafted professionally. You can easily download and edit the file according to your current needs, and you have the freedom to incorporate your own branding elements in order for you to launch your branding the market. Whether you are new or adept in computer editing, you can surely achieve a great design because this template has user-friendly file formats, such as Illustrator, InDesign, MS Word, Photoshop, and Publisher. Your desired design is just right at your fingertips, so do not miss this opportunity to have the best design for your menu. 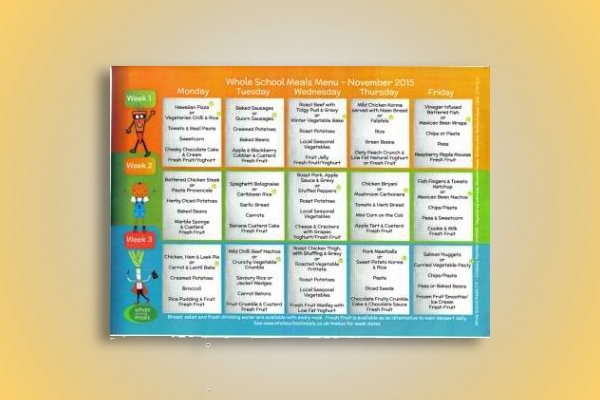 In this example, the students are presented with a weekly menu containing the specific food for a certain day. This is very helpful for students since they would know in advance what food is available in the canteen or they can preorder their own meals. For parents who are preordering the food of their children, this is also a great way for them to know what their children will be eating for that day and monitor the food consumption of their children. In addition to the list of food contained in this menu, also included are specific dietary requirements and food allergens in order to warn customers in case they have allergies to some food. During the winter season, most students would prefer a bowl of soup or any hot food in order for their bodies to stay warm. So, it is important that the food you are offering is suitable for the season not only to increase your profit but also to satisfy customers. Just like in this winter school menu example, the dishes offered are usually hot, heavy meals including fruits and vegetables. The menu is also organized per week, and the dish for a certain day is also specified. Note that when you are creating a menu, regardless whether it is for a canteen or restaurant, the food must be specific and there must be a brief description for each food to increase the appetite of the potential customers. 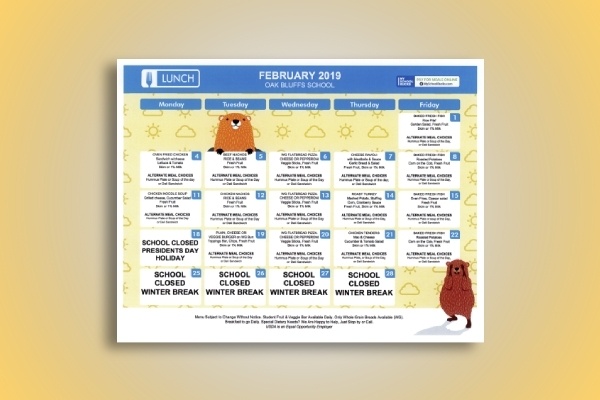 In this school lunch menu example, there are six menu options available and they can only be ordered during a specific week. For example, in the month of August, menu #3 will only be served on the last week; hence, you can only order that certain menu on the last week of August. There is also a specific day for a certain menu. This is designed as such to build customer’s anticipation with the food that you are offering and for the customers to decide beforehand whether or not to avail the food offered in the school canteen or cafeteria. Also included in this menu are the corresponding rates and charges of the meals. 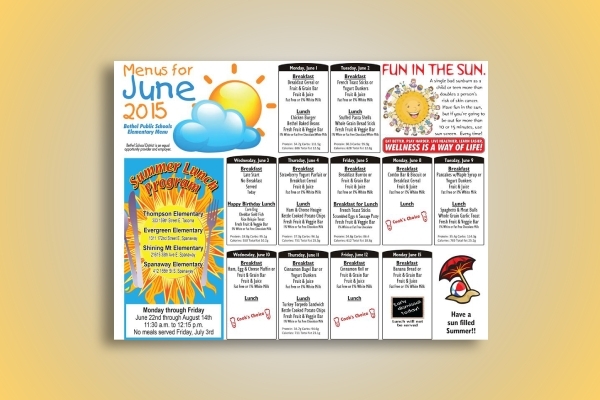 Be neat and arranged when it comes to your school breakfast menu or lunch menu by referring to this menu example. It sets out the breakfast and lunch meals for all the days in a month and even includes the proteins, calories, cards, and fat content of the meal. This information is important for those students who are conscious of the content of the food that they are eating as well as for parents who wanted to make sure that their children are getting the best nutrition even at school. Apart from food, the menu also includes drinks, such as chocolate drinks and white milk. 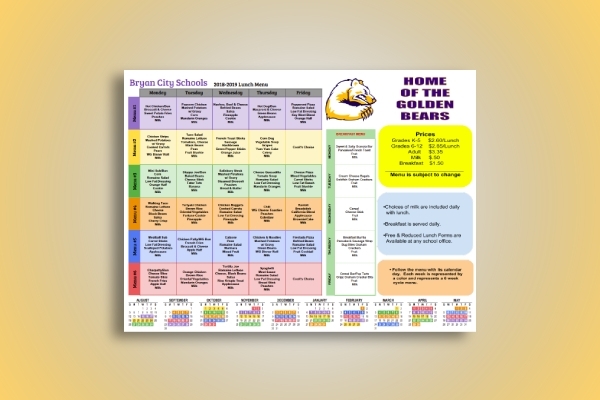 Stay organized when it comes to creating a school menu, and check out this organized school menu example which sets out the menu for each day of the month. Besides the main dish, the customer can also opt for alternate meal choices in case they do not want the main meal. In this way, there are a lot of options available for the customers, making them more excited to get their meals for the next days. This menu example is sort of a calendar or a planner example because it presents a calendar for a certain month and the corresponding meal for the week or a certain day. It even presents more choices as regards light bites, deli selection, sweet treats, and drinks. The method of payment available is online payment, making it easy for the parents to pay their meal orders for their children online.